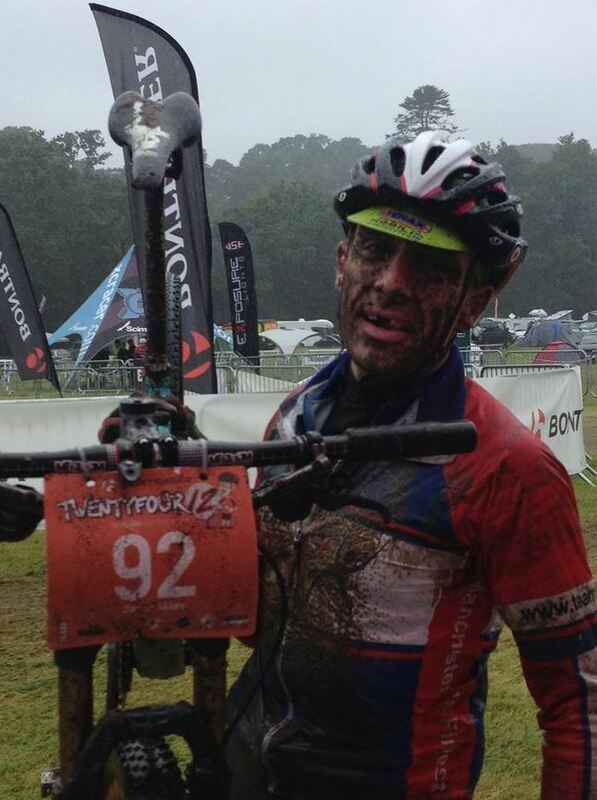 Jason Miles repeated his 2013 win at TwentyFour12 in the 24 hour solo category. It was far from plain sailing as once Jason had taken the lead after 11 hours of chasing, the weather turned very nasty – wind and heavy rain for hours on end contrasted sharply with the dry conditions at the start. I didn’t push too hard for three quarters of the race – I made sure I remained in contention and held enough back for a potential push towards the end but always had the World Champs in October at the back of my mind. A 24 hour race isn’t ideal as a training ride but I was going to preserve, rather than spend, as much fitness and wellbeing as I could. It was going well until the last 6 hours when the heavens opened and everything got harder, everyone got wet and I started to shiver. But it got harder for everyone so it didn’t make too much difference. I just did what I do and it turned out well. I was looked after again by loads of really generous people who give me stuff that makes this sort of thing a bit easier and affordable in return for me ‘giving it my all’ and not being grumpy. The event as a whole was as brilliant as it was last time, so credit must be paid to Martyn and his team of organisers, do-ers, caterers, look’er-after-ers and marshals.